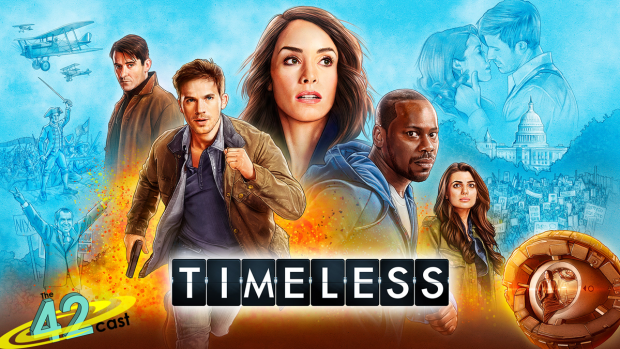 Timeless gained a second year because the fans demanded it. In a season with reduced runtime and a lower budget Timeless fought for its very survival and told another interesting story through time. In this episode we delve into the changes between Timeless season 1 and season 2, talk about the growth in the characters, and what we think of the evolving Timeless storyline. Sadly, this episode was recorded before we knew that there would be a finale film, so our speculations on a season 3 will always remain just speculations. This week’s Five Minute Controversy asks if it’s a good thing for Disney to acquire Fox. This week Ryan; Jen; and newcomer, Gerald, join the cast. Like what you heard? Follow us on Facebook at www.facebook.com/42cast. You can also find us on Twitter as @42cast. We can also be found on Stitcher Radio and iTunes. Please, leave us a review. Have a question for the Ultimate Answer? E-mail us at everything@42cast.com.